Rail Engineer regularly publishes articles that show the railway is really very high-tech these days. In-cab signalling systems, digital traffic management, remote condition monitoring, track-inspection trains, long-line public address, aerial surveys – it’s all very advanced and much of it would have been just a pipe-dream only a few years ago. The result is a railway that is becoming increasingly efficient and much, much safer as people can be withdrawn from the live railway, reducing the “boots on ballast” as technology does the risky work for them. That’s all very well, but there is one element that, as yet, the boffins have been unable to counter using advanced technology – the weather. It’s easy to see what he meant. Snow and ice that falls so infrequently that large areas of the country are unprepared for it and grind to a halt if one centimetre of snow falls, more White Easters than White Christmases, wet summers, dry winters, floods, droughts, gales and storms. Some of it can be predicted and steps are being taken to mitigate against the worst of the problems. The overhead wiring on the Great Eastern, that would expand and start to sag in hot weather, is being replaced using spring tensioners to keep it taut in all conditions. A number of areas of track, particularly complex crossovers and junctions, are now painted white to keep the rails cool and prevent buckling on sunny days – white paint can reduce the temperature in steel rails by up to 10 degrees. But there is one area that technology can’t do much about, at least in the short term – and that’s the very ground the railway is built on. The Great Fall – Folkestone Warren, Kent, 1915. When the railway construction boom took place, back in the nineteenth century, not only was ground engineering fairly unsophisticated but there were other factors that caused many earthworks to be less than ideal. Railway companies were short of money, so they bought the minimum amount of land they could get away with. So, cuttings faces were steeper than may have been wise – the same for embankments. In addition, the spoil from a cutting simply became the next embankment. There was no selection of material, the earth from one site was just transported and tipped at the next site. Drainage was rudimentary, if there was any at all. For the last 150 years, those earthworks, which got off to a bad start in many cases, have been thoroughly wetted by rain and then dried out in the sun. They have been subjected to attack by burrowing animals, had the roots of plants and trees drill down into them and had various ‘remedial’ works performed on them. Little wonder many are now feeling their age. Some of the materials used were, by chance, quite good. Rocky ground in the North West causes fewer problems than the clays and mudstones of the South East, but that isn’t to say there aren’t problems everywhere. Even good ground can’t compensate completely for bad engineering. The solution is very low tech. An army of men and women, armed with diggers, piling rigs, geotextiles and meshes, have to descend on the site, often in bad weather. They have to not just restore the ground to what it was, with its original inherent faults, but to restore it to how it should have been, with the benefit of twenty-first century hindsight. 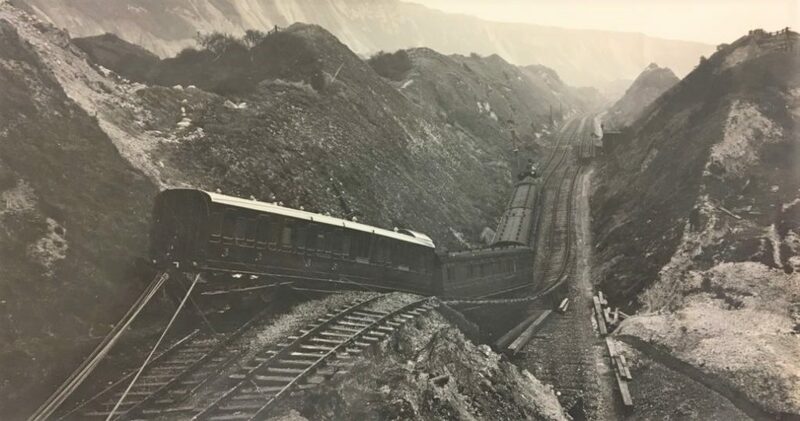 Train derailed by the Great Fall of 1915. While its tempting to blame ‘global warming’ for the problems today, that’s not the case, or at least – not only. Landslips have affected the railway long before global warming became an issue. One of the worst was the ‘Great Fall’ of 1915. This took place at Folkestone Warren in Kent. The South Eastern and Chatham railway line was moved 50 metres towards the coast as 1.5 million cubic metres of chalk fell into the sea, following weeks of heavy rain. The line was closed for almost four years, as repairs were delayed by the Great War. Photographs of the incident show a badly affected train, but it wasn’t as bad as it looks. 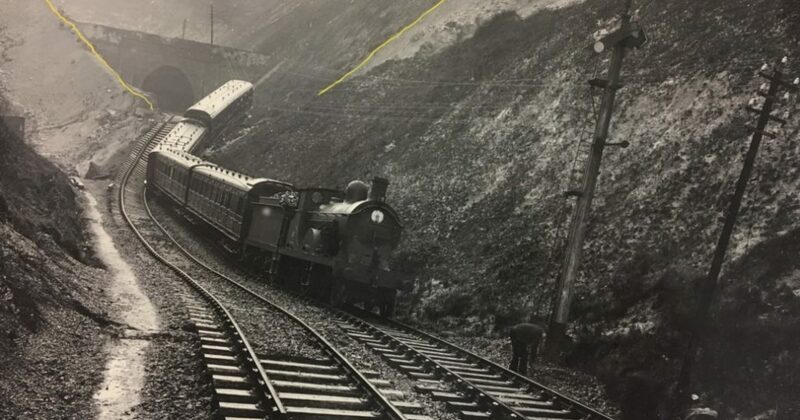 Derek Butcher, the Network Rail route asset manager for geotechnical engineering who found the historic images in a filing cabinet while moving offices, explained: “We believe the train pictured was alerted to the landslip by the signal box at Folkestone Junction and was slowed down and found itself part on and part off the landslip. They were able to evacuate passengers who walked through the tunnel to Folkestone Junction station. The kink in the line remains visible today, underscoring the severity of the incident. Landslips have been a major feature of the line since it opened in 1844. In 1877, two people died when part of the Martello Tunnel was destroyed. The line remained closed for three months afterwards. The last major movement was recorded in 1939 but Derek said some ground movement had forced Network Rail to implement speed restrictions on the line in recent years. The need to take such precautions typically follows a very wet winter. Derek Butcher was involved in a much more recent landslip in the South East. 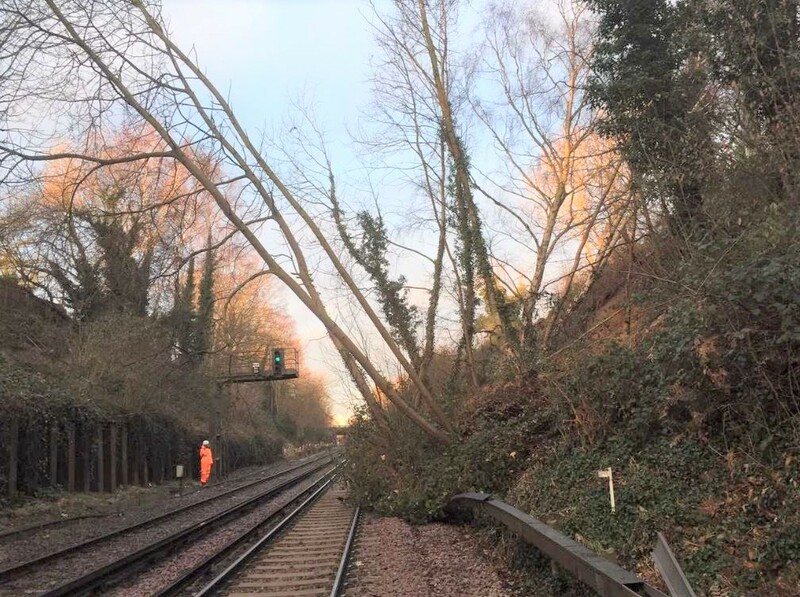 At 12:45 on Wednesday 13 March, the Tonbridge signaller reported that a train on the Charing Cross to Hastings line had struck overhanging vegetation just south of Wadhurst station. Damage was slight and the train was able to continue on to Charing Cross, but a Network Rail team was despatched to investigate the problem. At first, there was nothing much to report, just some small trees overhanging the line. But, when the team started to clear the vegetation, it was noticed that the reason the trees were so close to the track was that the cutting face they were growing out of had slipped down towards the line and was still moving. The Up line was closed to traffic at 13:45, followed by a full block of both tracks at 14:15. Further investigation was impossible as the moving earth, some of it in large clods measuring five metres by two metres, continued to move, making it too risky for inspectors to get on site. Things had calmed down by 07:00 the following morning, when Derek could make an assessment. He noted that some 60 tonnes of material had slipped, possibly due to a combination of heavy rain and high winds, and this would need to be removed. The line would probably be closed until after the weekend. Negotiations took place with the farmer who owned the field at the top of the cutting to allow access for a 130-tonne excavator, with a 30-metre-long reach, that could drag the loose material up the cutting face and then pile it safely to one side. The excavator did just that, removing unstable earth that, while it hadn’t yet slipped onto the railway, could have done so at any time. A smaller excavator worked at the bottom of the cutting, removing debris there. By Sunday afternoon, work was progressing well. The top of the cutting was now clear, and work was continuing well at track level. However, reports then came through from the team conducting aerial surveys of the cutting. A second slip had occurred, one kilometre further south, over the southern portal for Wadhurst tunnel (above). Material had obviously moved, but hadn’t fallen onto the track. It couldn’t be left there as it could move again at any time. Another 60 tonnes had to be removed. The heavy equipment at the first site was duly moved south and began pulling material away from the tunnel portal. This continued throughout the night and the railway was finally handed back at 04:45 on Monday morning, before the first train and in time for the rush hour, with a 20mph temporary speed restriction in place. More work is needed, and this will take place overnight on weekdays, without interrupting traffic, until the speed restriction can be removed. The line at Wadhurst was thought to be only at medium risk from a landslip, so it wasn’t monitored. 30 miles away, where the Bexleyheath line between Lewisham and Dartford, Kent, passes through a cutting at Barnehurst, there was thought to be a much greater chance of a slip. Opened in 1895, the cutting faces are steep, and Derek Butcher commented that the cutting was monitored, using both CCTV and remote condition monitoring. An intelligent monitoring system consisting of 250 triaxial tilt sensors, communicating continuously with 10 solar-powered infra-red cameras, had been supplied by Senceive to give early warning of any failure. At 03:30 on Monday 11 February, just such a warning was given. A tilt sensor had detected significant movement and alerted a rail surveying and monitoring engineer at the contractor Costain, employed by Network Rail, who was sent automatic text alerts and infra-red-illuminated camera images. The landslip had caused a tree to fall on the tracks, blocking the line. The line was therefore closed and trains cancelled. This was the fourth time this cutting face had slipped since 2010, hence all of the monitoring arrangements. After examination by engineers, the decision was taken to clear the site and then to make the cutting safe by using H piling – H-shaped steel beams driven into the ground with concrete panels between them to build a wall that will prevent slippage in the future. 300 tonnes of earth and trees were removed and then work could start on the 30 metres of wall. Piling was finished by Friday 15 February and the wall infill panels completed over the weekend. Work was also undertaken to ensure the track was safe, replacing and replenishing contaminated ballast, and after test trains ran through on Sunday evening to check the repairs and test the signalling, the railway was ready to open on Monday 18 February, one week after the landslip had occurred. Landslips aren’t the only problems that the weather can cause. Floods can leave the railway under water, shorting out track circuits, damaging signalling equipment and contaminating ballast so that, once everything dries out, it needs to be replaced. That’s if the water doesn’t wash the ballast away altogether, leaving tracks hanging in space and unsupported. Which is just what happened recently on the Conwy Valley line in Wales. 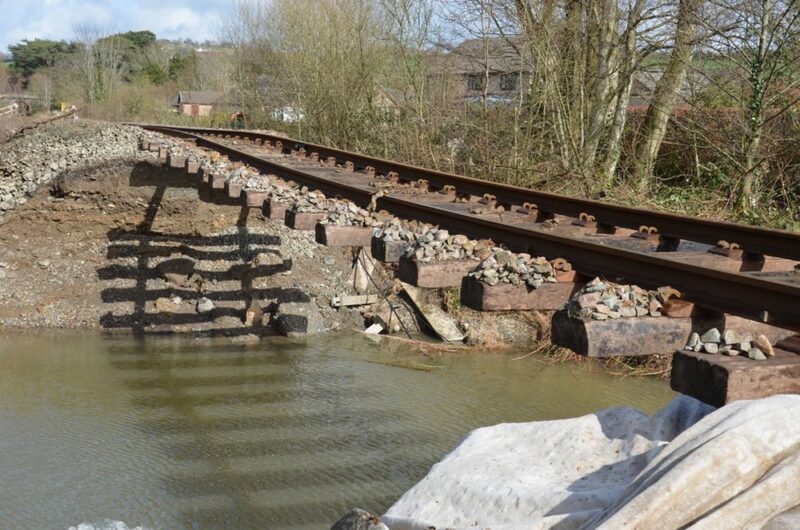 Following damage caused by Storm Gareth in March, the line, which runs between Llandudno Junction and Blaenau Ffestniog, will remain closed for a number of months. 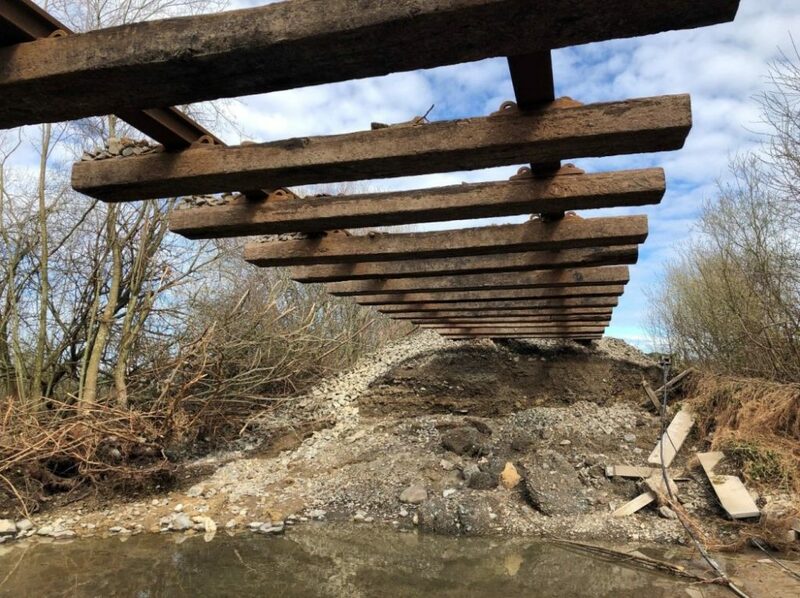 Detailed inspections revealed that at least nine sections of track, as well as lineside equipment, embankments, bridges, level crossings and stations, would require significant repairs. It’s not the first time this line has been so affected. It was closed for several months in 2003 after heavy rain washed away the track near Betws y Coed. Then, heavy rain on Boxing Day 2015 resulted in floods damaging the formation in over 100 places, costing £2 million to repair and closing the line for 10 weeks. Storms also damaged a structural pillar in the tunnel at Blaenau Ffestniog in 2017, once again closing the line, this time for three weeks. However, in one positive example, a £4 million project is underway to move thousands of tonnes of soil to protect the railway in West Cumbria from landslips. Last November, a small section of the Victorian-built embankment collapsed after becoming saturated by water running off the surrounding landscape. Passengers and freight suffered delays on the railway between Carlisle and Whitehaven. Now, fifty thousand tonnes of earth are being moved by a 30 strong workforce using specialist diggers on the steep coastal slope at Lowca. This project draws on a £153 million fund to keep 2,500 railway locations across the north safe and reliable. 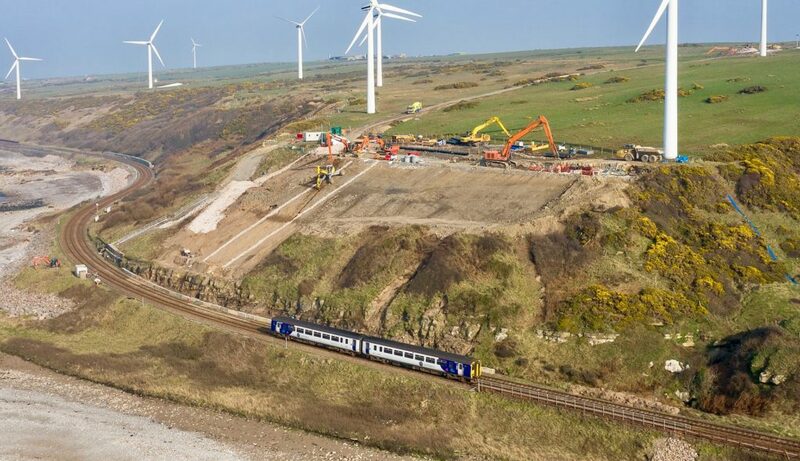 £8 million is being spent on the Cumbrian Coast line, following a £3 million overhaul of three miles of track between Millom and Bootle in February and with the line between Whitehaven and Bootle to be renewed in the summer. 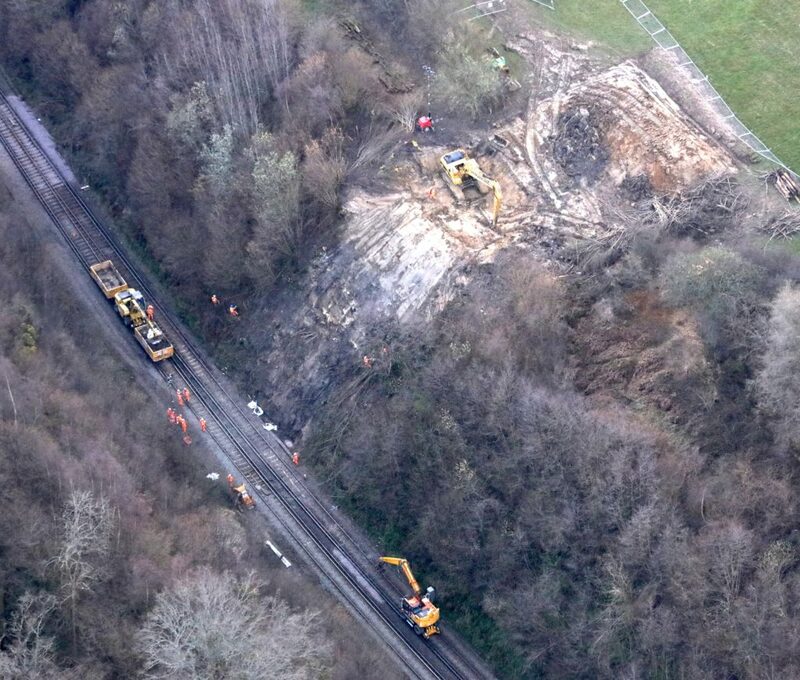 Network Rail route asset manager Tony Butler said: “The removal of such vast amounts of soil is a huge task in a challenging location, but is vital to help keep trains running on this economically important route. If only it was that easy all around the network. As long as the British weather has its way, landslips, floods and storm damage will continue to be a constant challenge to engineers around the country. Some will be small events causing local delays, such as Wrecclesham, Surrey, in 2016, Lambhill, Scotland (2017) or Porth Treherbet, Wales (2018). Others will be major catastrophes that catch the nation’s attention and close the railway for months – Eden Brows, which closed the Settle-Carlisle line for a year (2016), Hatfield and Stainforth, a landslide on a colliery spoil tip that blocked the railway between Doncaster and Scunthorpe for five months in 2013, and the approach to Harbury tunnel, between Banbury and Leamington Spa, which resulted in a closure of only six weeks in 2015 after Network Rail repaired the damage three weeks quicker than had originally been estimated. And, of course, we haven’t even looked at coastal events where the sea plays its part and causes havoc such as the seawall breaches at Dawlish (2014) and Shakespeare Cliff, Dover (2015). The British weather will keep geotechnical engineers such as Derek Butcher busy for a while yet.